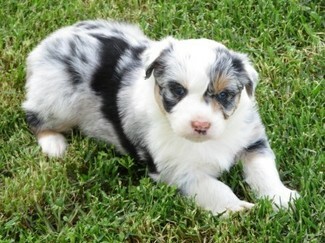 Subscribe to our youtube channel at Fifteen Acre Farms Australian Shepherds to see additional videos and take a tour. To reserve a Fifteen Acre Farms puppy, or schedule an appointment to visit our puppies age 6 weeks and older, call and leave a message or text Laura Perry at 918-706-1931. You may also email fifteenacrefarms@yahoo.com and include your name, phone number, location so I will know if air travel is needed or if you plan to pickup here, the puppy that interests you, & if you are a responsible pet owner and plan to spay/neuter. $200 NON-REFUNDABLE deposit required to hold a puppy. Be sure you are ready for the commitment of adding a puppy to your family BEFORE you pay deposit to reserve one. Payment accepted by personal check, business check, Visa, Mastercard, Discover, or American Express. We never charge an additional fee to pay by credit/debit card. We do not accept payment via money order or cashier's check. Darcy is a black tri with Penn Hip evaluation and NO EVIDENCE OF OSTEOARTHRITIS/HIP DYSPLASIA FOR EITHER HIP and is DNA tested CLEAR for Collie Eye Anomaly, Cone Degeneration, Degenerative Myelopathy, Hereditary Cataracts, Hyperuricosuria, Multidrug Resistance, Multifocal Retinopathy, Neuronal Ceroid Lipofuscinosis 6, & Progressive Retinal Atrophy/Progressive Rod Cone Degeneration. Jaxson is a Champion Sired blue merle male with Penn Hip evaluation and NO EVIDENCE OF OSTEOARTHRITIS/HIP DYSPLASIA FOR EITHER HIP WAS FOUND and is DNA tested clear for Collie Eye Anomaly, Cone Degeneration, Cyclic Neutropenia, Degenerative Myelopathy, Dilated Cardiomyopathy, Hereditary Cataracts, Hyperuricosuria, Multidrug Resistency, Multifocal Retinopathy, Neuronal Ceroid Lipofuscinosis 6, & Progressive Retinal Atrophy/Progressive Rod Cone Degeneration. To see pedigree's and lab reports for Jaxson and Darcy, click the link above for the Pedigree's and Lab Reports page. Darcy's Puppies are available for immediate pickup or they can arrive the airport nearest you on 05/29/18 if air travel is needed. Fifteen Acre Farms is located 30 minutes north of Tulsa, OK and 2-1/2 hours from Oklahoma City. Families and breeders from Canada, Mexico, Puerto Rico, & 45 US states have made their selections here so we have plenty of references available & experience transporting live animals via Priority Parcel Service on American, Delta, & United Airlines. Air travel in the continental United States, Alaska, Puerto Rico, & US Virgin Islands is $500 for one puppy or for two puppies flying together at age 8 or 9 weeks. Read the "Shipping" page to address any concerns you may have regarding air travel for live animals and for a breakdown of the cost. Because we are centrally located in the US, our puppies are usually only intransit 2-7 hours depending on destination. View the "Airports" page to choose an airport nearest you for pickup. We work at home & spend alot of time EVERY day with our animals. Our main focus is producing quality healthy PUREBRED puppies from health tested parents & placing them with responsible pet owners as a valued family member living a long and happy life being the best they can be. In addition, our breeding program & facilities are AKC, State of Oklahoma, & USDA LICENSED, INSPECTED, & APPROVED with the highest ratings. EYE COLOR & SIZE: Be sure you have a good understanding of how genetics work regarding eye color in this breed and DO NOT have unrealistic expectations of me as a breeder. Each puppy has a 50/50 chance of having blue eyes.... that’s 50% chance they will and 50% chance they won’t. It really is that simple. In this breed, eye color can change at any time during the lifetime of the puppy so I can neither predict nor guarantee eye color and conversations regarding blue eyes are not a preferred topic of conversation for me. In addition, I will never tell you what you want to hear just to make the sale. What I CAN do is provide you the buyer with an IMPRESSIVE selection of quality healthy puppies produced from the finest of the breed consisting of the proper balance of health by CAREFUL genetic selection, intelligence, & beauty that transition quickly and well from our care to yours with a terrific start on obedience training, potty training, and sleeping through the night. Color genetics lesson: Uppercase “B” represents black and blue. Lowercase “b” represents red. ALL red dogs have two red genes (b/b). It’s genetically impossible for a red dog to have a black (B) gene. Darcy is a black factored black tri (B/B). 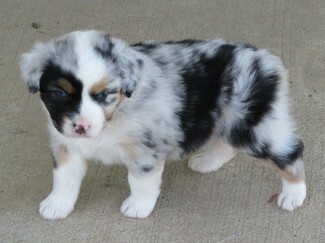 Jaxson is a red factored blue merle (B/b). Therefore ALL puppies in this litter are either B/B black factored blue merle and black factored black tri getting the uppercase B gene from both Darcy AND Jaxson or B/b … red factored blue merle or red factored black tri … getting the uppercase B gene from Darcy and the lowercase b gene from Jaxson. There are no reds in this litter because ALL red dogs are b/b and Darcy does not have a b gene to offer. Probability is that half the litter is red factored (B/b) and half the litter are black factored B/B but could be a combination of any number from 0 to 9 either way. The red gene should not be confused with copper trim. ALL of our parents have copper trim so ALL of our puppies have copper trim. It is also the merle parent that determines the number of merle’s in the litter so in Darcy’s litter Jaxson gave his merle gene M 7 times out of 9 and his tri gene m 2 times out of 9. A merle dog has one merle gene M and one tri gene m represented as M/m. A tri dog has 2 tri genes represented as m/m.